LASER FIBER OPTIC SOURCE IPG 500W - Available 700w and 1000w. INDUSTRIAL REFRIGERATOR CHILLER: YES, Included. PG’s High Power CW Fiber Lasers cover output power range from 0.5 kW to over 100 kW and feature a wide range of operating wavelengths, single-mode and multi-mode options, high stability and extremely long pump diode lifetime. These lasers are water-cooled and can be suppiled with a built-in or standalone chiller. The lasers are available with a wide variety of fiber terminations, collimation optics and processing heads. To cut stainless steel and aluminum with air. Add shipping and Installation Service. Various materials release small amounts of fumes and gases in the engraving or cutting process. To extract these fumes and gases, our exhaust system comes equipped with 12 feet (4 meters) of flexible ventilation duct tubing to be installed when the machine is being operated inside a small and enclosed area. 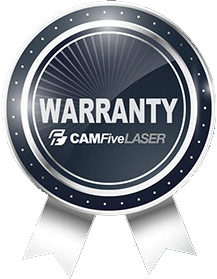 CAMFIVE LASER FC22 FIBER METAL CUTTER EQUIPPED WITH IPG 500W SOURCE AND 2 X 2' enclosure frame. Our CAMFive Laser Model FC22 equipped with IPG Source Metal Cutter and enclosure frame design is the fastest and cleanest way to cut metals like steel (stainless, mild, galvanized, mirror) Copper, brass, aluminum and more, some of them up to 3/4" or 18 mm thick. It offers a stable and precise drive system with a German ball Screw displacement axle, fast Japanese Yaskawa servo driving motors and dynamic auto-focus. Our lasers have been built under our CNC (Computerized Numerical Control) standards & tolerances, using strict manufacturing processes that guarantee maximum stability and minimum wear and tear of its components throughout its lifetime. Our machines can operate 24/7. It offers a stable and precise drive system with a Japanese brand displacement axle and accurate and fast step driving motors. The optical system has an American brand lens that has been optimized for outstanding performance during cutting and engraving on different materials. LASER SOURCE: IPG Brand 500w Fiber Laser Source - Available 700w and 1000w. WORKTABLE: Specialized in Metals. Strong design. OXYGEN-NITROGEN-AIR VALVE: This system features oxygen, nitrogen, and air valves to regulate the gas flow, a filtration system that prevents water and dirt molecules to reach the lens, a smart air/oxygen flow system, that allows you to control when the gas comes out and an oxygen pressure indicator to make sure you are getting the right pressure you need to keep the best quality when cutting metal. AUTOFOCUS SYSTEM: Sometimes metal sheets are not completely flat. Our “Auto Focus” system is highly efficient and regulates the focus length controlled by a sensor on the laser head automatically. This sensor detects the gap between the nozzle and the material surface at all times. As the cutting process begins the sensor will track the contour of the metal and adjust the nozzle in the z-axis keeping a constant focus point assuring clean and polished edges. JAPANESE SERVO MOTORS: High precision, detailed capacity, and speed are key elements to obtain the best quality when laser cutting, this is why CAMFive incorporates Japanese Mitsubishi or Jaskawa servo motors on the steel X and Y axis as well as digitally controlled Drivers. Servo technology is known for its high precision, smooth movements and the ability to operate without cogging at a high speed. LCD MULTILANGUAGE OPERATING PANEL: User-friendly multilingual LCD Control Panel is incorporated as well as Potentiometers to regulate the laser output power, laser beam on/off button and keyed Security Lock-out switch. “BALL SCREW” AXIS: It is a safe and fast movement system that delivers high precision and easy maintenance. Known as “ball screw”, this system travels smoothly on the gears at high speed reducing to “0” the chances for the machine to get out of phase. It is made with strict manufacturing processes that guarantee maximum stability with minimum wear and tear. SAFETY FEATURES SUCH AS DOOR SENSORS, EMERGENCY STOP BUTTON: Door sensors to stop the laser beam automatically. Our laser machines are equipped with security sensors and safety features disabling the equipment in case of inappropriate use or unsafe operational conditions. Emergency Stop Button gives the machine operator the ability to IMMEDIATELY and completely shut down the entire machine in case of a problem or any event. The safety turn on Key feature prevents an unauthorized use or operation of the laser machine, allowing only approved operators and/or trained personnel responsible for the operation and maintenance of the equipment. CONTROL SOFTWARE AND INTERFACE: Through a delicate and algorithmic own adaptation, our software uses Bezier's algorithmic curve to help to delineate vector edges in motion, while the speed increases it gets better curving within the range that is working. This algorithm can also avoid incineration or " burning" of material during the cutting process allowing to have a smoother finish on the cut pieces. This software is compatible with a large variety of design programs (Such as Corel Draw. Illustrator, Photoshop, Autocad, and more). COMPATIBLE FILE FORMAT: Supports almost all the design and picture formats such as, cad, bmp, gif, jpg, ai, oux, cut, dsb, dst, dxf, emd, nc, out, plt, smc and more. AUTO COLLIMATOR " FOR AUTOMATIC CALIBRATION: Our FC series incorporate a self-calibration system that reduces setup times and maintenance. Aligns the laser beam precisely. ELECTRONIC WATER CHILLER UNIT (Optional): the electronic water chiller helps to regulate the laser tube temperature while in operation by keeping the water at room temperature. This is a highly efficient unit that requires minimum maintains. (Ask your advisor if included with your system). FUME EXTRACTION SYSTEM (Optional): Various materials release small amounts of fumes and gases in the engraving or cutting process. 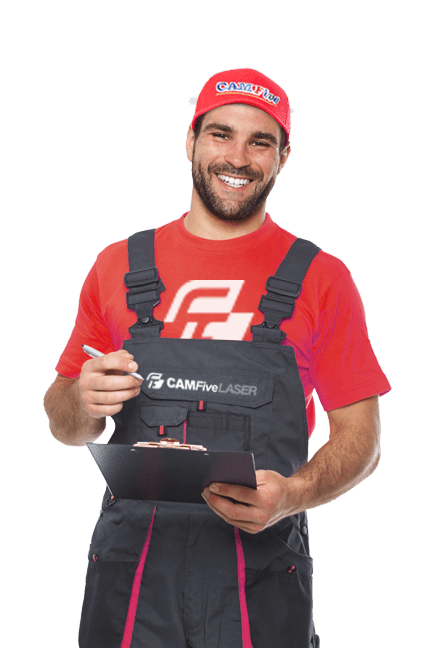 To extract these fumes and gases, our CAMFive comes equipped with an exhaust system and 12 feet (4 meters) of flexible ventilation duct tubing to be installed when the machine is being operated inside a small and enclosed area. (Ask your advisor if included with your system). VOLTAGE REGULATOR (Optional): 8000 or 16000 VA (depending on the model you choose) voltage regulator is provided to protect the laser machine’s electrical components and sensitive electronics. (Ask your advisor if included with your system). Fill out this contact form to make an appointment or contact us and schedule a trip to visit our assembler factory in China. WHICH ARE THE MOST POPULAR METALS FOR CUTTING? Our FC Series is exclusively designed to cut metals at an incredible speed and accuracy, it will allow you to have the cleanest cuts and unimaginable detail, it is almost impossible to achieve this results with any other metal cutting machine. It requires air, oxygen or nitrogen assist, depending on your needs, the machine already comes fully equipped with systems to support all 3 consumables. Aluminum / Air G 19 - G 16 G 19 - G 11 150" - 20" x min G 19 - G 11 708" - 71" x min G 19 - G 11 G 19 - 5/16"
The thickness and the cutting speed specified in this table are just a reference. They may change depending on the material Brand and hardness. Laser Type High Performace Fiber Optic Laser Source (Specially Designed for Metal Cutting). Laser Power IPG 500W (Available Upgrade to IPG 700w and 1000w). Working Area 24 inch x 24 inch (60 cm x 60 cm). Machine Dimensions Length: 78" (2.00 mt), Height: 66" (1.69 mt), Width: 79" (2.00 mt). Control Software Last Version (included) for vectors and graphics processing. Graphics Format Supported CAD, DFX, and others. Working Voltage 220V or 380V 50 - 60 Ghz.